If you’re looking for the best budget 76-key digital piano keyboards under $300, then you're reading the right article. The keyboards we’ve reviewed are perfect for beginners as well as intermediate piano players. If you think $300 is too high, you might want to check out our review of the best 61-key keyboards for beginners under $200. If you need more than 76 keys, and consider yourself to be an advanced player (or soon to be advanced! ), then check out our best digital piano reviews where we have reviewed in detail some of the best digital pianos in the $500-$2000 range. If you've got a young child who's interested in learning to play the piano, then check out the best electronic keyboard for beginners (under $100) that's best for kids and children! Who Should Buy A 76-Key Keyboard? Before we dive into our review, let’s get to know first WHO should consider a 76-key keyboard as opposed to 61 keys or the piano-standard 88 keys. A 76-key electronic piano keyboard is perfect for those who want more than a 61-key keyboard can offer. It is especially useful if you will be playing some musical pieces which require more than the basic 61 keys. It is great for beginners and intermediate piano players who are serious about truly learning how to play the piano and hope to someday transition to a full 88-key piano. It’s great for musicians who are on a tight budget. 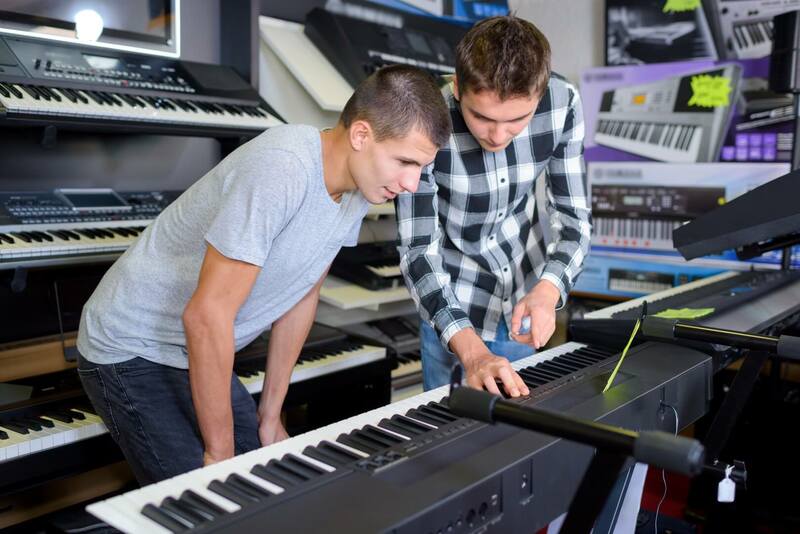 If you don’t have a few thousand dollars to spare for a piano, then a 76-key digital piano or keyboard is a perfect and affordable alternative! 76-key keyboards are portable and can easily be transported to other locations. Try doing that with a piano that weighs a ton! Music keyboards from reliable brands like Yamaha, Korg, Casio, and more offer authentic piano voices which set it apart from cheaper keyboards with tinny-sounding voices. If you think a 76 key keyboard is what you need at this point of your musical journey, then read on to find out what our top recommended budget keyboards are. Read on for our detailed reviews of the top 5 best 76-key digital keyboards for beginners, intermediate and advanced piano players. "Perfect For Those Who Want To Focus On Playing Music"
Deceptively simple design allows you to focus on what matters most when buying a keyboard – playing awesome-sounding music! Very affordable price perfect for musicians on a tight budget. The portable design is great for musicians who travel to various locations for gigs and practice sessions. Auto-power off feature is great if you’re playing on batteries. Some may not like the limited options on the keyboard such as having only 10 voices and being able to record only 1 song. No graded-hammer action but at this price this omission is quite normal. If you want a classy-looking keyboard that comes in 2 timeless colors (black/white) that’s well worth the sub-$300 price, then the Yamaha NP32 might be what you’re looking for. It’s a light, compact, piano-style keyboard at only 20 pounds so if you plan on playing in multiple venues then this keyboard is perfect for you! The NP32 looks deceptively simple, with only a few buttons present on the dashboard. Some may prefer their keyboards with an LCD display and a plethora of visible buttons but here at SoundsElectric.org, we find that the absence of said buttons will actually help you focus on your practice. Enough with the fiddling and button-pressing and just get on with the playing – this should be the NP32’s tagline! Another outstanding feature of the Yamaha NP32 is the quality of the instrument voices it features. There are 10 voices available (Piano 1, Piano 2, Electric Piano 1, Electric Piano 2, Organ 1, Organ 2, Strings, Vibes, Harpsichord 1, and Harpsichord 2). Some may find these lacking if they’re used to choosing from hundreds of voices available on other keyboards. But again, we find that the preset voices available on this keyboard are more than enough for playing piano music. Plus, we guarantee those 10 voices sound absolutely realistic even to the most well-trained of ears! Imagine closing your eyes and thinking you’re listening to a Yamaha concert grand piano. With the NP32, this is certainly possible! While we think the built-in speakers are awesome for playing in a small room, if you truly want to capture the nuances of its grand piano voice, then we recommend using a good pair of headphones or external speakers. Trust us, you will be blown away by the sounds coming from this compact keyboard! Another outstanding feature we love about the NP32 are the ‘Graded Soft Touch’ keyboard. This basically means that they keys in the lower third of the keyboard (the bass register), has a heavier feeling as opposed to the higher notes which have a lighter feel. It’s not the hammer-action that most piano players look for, but it’s certainly close! It feels really natural and of course, it sounds very expressive. If you want to impress your family and friends, how about recording them a sample and sending it to them electronically? With the 1-touch record function, it’s very easy to do. You can record only a single song though so better make sure you get your music perfect before you hit that record button! Lastly, iOS users are going to absolutely love the NP32 as Yamaha offers a range of iOS-compatible apps for use with the Piaggero keyboards. Apps such as NoteStar, Metronome and Digital Piano Controller can be accessed with either a wired (USB to host) or wireless connection (you can use the optional UD-BT01). 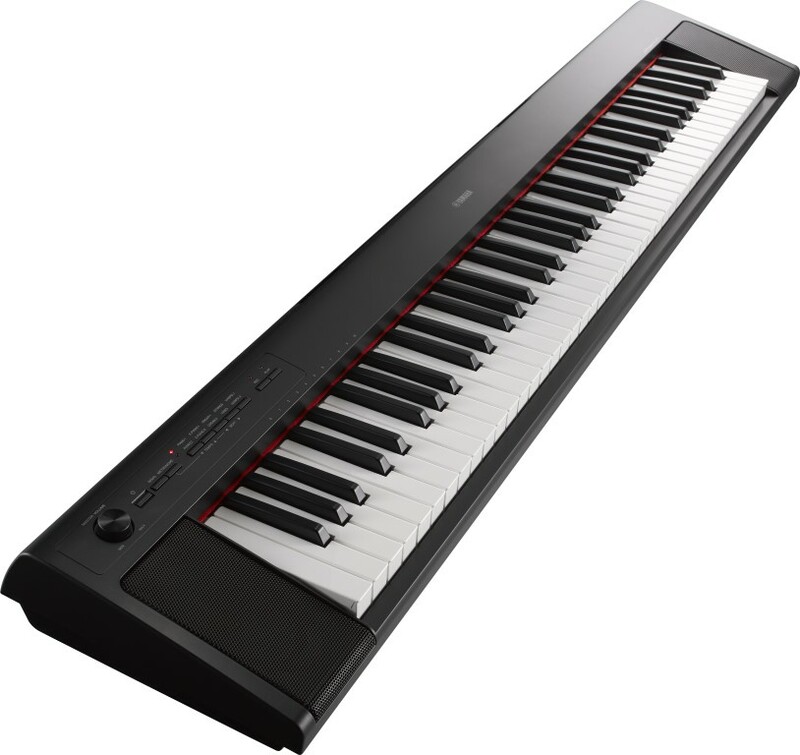 Read our complete review of the Yamaha NP-32 76-Key Portable Keyboard here. 1. Should you upgrade if you’re coming from a 61-key keyboard? If your old 61-key keyboard is broken and you’d rather buy a new one instead of spending money for repair, then yes, the Yamaha Piaggero NP32 is a worthy upgrade. Or if you’ve outgrown the 61 keys and need to play more complex musical pieces, then do consider the NP32. 2. Is it great for gigs and live concerts? Yes, it is. The built-in speakers are okay but of course the keyboard will sound much better if you’ve got an even better sound system! For gigs such as indoor or outdoor concerts, church, social gatherings, and more, you can be assured the NP32 will show up to impress (you just have to make sure you do the instrument justice!). 3. Is it touch sensitive? Yes, it is touch sensitive. This makes the keyboard a viable alternative to the more expensive hammer-graded keyboards. What Are Other Users Saying About The Yamaha NP-32? "Best Electronic Keyboard For Beginners and Intermediate Piano Players"
Important Note: The Yamaha YPG-235 and the Yamaha DGX-230 are basically exactly the same keyboards with the same outstanding features. However, these are sold in different countries (YPG models are sold in the US and DGX models are sold in the UK). Yamaha is well known in the music industry for producing quality keyboards with excellent instrument voices and of course, sturdy hardware. There are plenty of Yamaha keyboard owners who’ve owned the same keyboard for a decade or two! If you’re one of them, and you’re in need of an upgrade, then read on to find out if the Yamaha YPG-235 | DGX-230 fits your needs. For beginners and intermediate piano players who find 61-key keyboards lacking or the 88-key ones to be too much for their needs, the 76-key Yamaha YPG-235 | DGX-230 is just about right. This portable digital keyboard weighs in at a mere 18 pounds (without batteries) so you can easily carry this around when travelling. You can choose from nearly 500 instrument voices, 30 preset songs, and 160 preset styles so if you’re ever bored with playing using piano voices, you can easily switch to fun voices including ‘Sweet!’ and ‘Cool!’ voices! Of course, if you want to go back to playing piano voice, all you have to do is just click on the dedicated Piano Button and a very well sampled Yamaha Portable Grand Piano voice will stream through the speakers. The Graded Soft Touch Keyboard (also featured in the Yamaha Piaggero NP32) offers a wonderful piano experience to players as the lower keys have a heavier feel than the higher keys. The YPG-235 | DGX-230 includes an Easy Song Arranger feature which is basically a feature that allows you to change your song’s default style to something like a ballad, hip-hop, bossa nova, etc. Additionally, you can even play with the melody voice and change it to something you think sounds nicely with the song (great for creative pianists!). In addition to having an internal music database which features many different styles, the YPG-235 | DGX-230 also gives you the ability to transfer music database files from a computer or USB stick. Furthermore, it even includes a Performance Assistant Technology which will help make you look like the world’s best pianist! It doesn’t matter if you press the wrong keys, this new technology will cover up your mistakes and you’ll look like a pro to your peers (just don’t forget to practice your movements and play in time with the music)! Lastly, one of biggest features that comes built-in in this keyboard is the Yamaha Education Suite. This alone makes the spend worthwhile especially for total beginners who might be thinking this keyboard is too advanced for them. This feature will allow you to master many songs with easy step-by-step lessons. If you practice regularly (like you should), then we can guarantee you’ll be playing like a pro in no time at all! Read our complete review of the Yamaha YPG-235 76-Key Portable Grand Piano Keyboard here. 1. Does the keyboard have a transpose function or feature? Yes, if you need to adjust the keyboard’s pitch, you can transpose 12 steps to the left and 12 steps to the right. Additionally, the pitch bend wheel will do a quick transpose job too. 2. How many songs can I record? You record a maximum of 5 songs or 6 tracks (5 melody + 1 chord). However, these aren’t unlimited-length songs. The keyboard has a maximum data capacity of about 10,000 notes (for melody-tracks recordings) or 5,500 chords (for chord-tracks recordings). 3. Are the keys weighted? Unfortunately, no, they are not. But Yamaha used Graded Soft Touch technology which mimics hammer action (a bit) by making the lower keys heavier to press than higher keys. Also, the keys are touch sensitive so if you press down hard, the notes are going to sound louder than if you pressed lightly. What Are Other Users Saying About The Yamaha YPG-235 | DGX-230? "Best Piano Keyboard For Intermediate Players"
Marketed as a ‘powerhouse’ of a keyboard, the Yamaha PSREW400 is targeted towards intermediate to advanced piano players. However, we still included this model in this article because it does have beginner-friendly features which makes it perfect for beginners who are planning to pursue more advanced piano lessons. After all, you can only play so much on a 61-key keyboard. It’s better to just buy a 76-key keyboard from the get-go so you don’t spend twice as much for buying a 61-key model then buying a 76-key model after a year or so (that’s just a waste of good money!). What we really like about the Yamaha PSREW400 is the fact that it offers a wealth of music options. It features 758 high quality instrument voices including their newest sampled voice Live! Grand Piano voice. Yamaha is known for its realistic piano sounds and this new piano voice is the best sounding one so far! They’ve also included 220 backing styles so you have plenty of accompaniment choices for your songs. Additionally, the 10 different DSP effects will give a new dimension to your music by giving you dynamic and realistic sounds! A great feature for beginners is the Yamaha Education Suite which will help teach new students how to play several built-in songs. There are 3 lessons (listening, timing and waiting), repeat and learn, and a chord dictionary. All these tools are designed to help you learn how to play the piano faster. You can also record up to 10 songs or approximately 19,000 notes (this is almost twice as much data capacity as the Yamaha YPG-235 | DGX-230). So if you want to record your music, you can do so and then use the USB Host/Device connectivity to transfer your files to your computer. Or you can just digitally record directly to your tablet or computer (we think this is a pretty neat feature!). You can produce powerful sounds from the 12W + 12W amplifiers. Plus the L/R outputs at the back of the keyboard will allow you to connect your instrument to a PA system or even a recording hardware. More advanced players, or even professionals, will also love the Yamaha PSREW400. If you are one, and you play in gigs all the time, then the 2 live control knobs and the pitch wheel are great tools at your disposal so you can quickly customize your performance. Read our complete review of the Yamaha PSR-EW400 76-Key Portable Electronic Keyboard here. 1. Does it have touch sensitive keys? Yes, the Yamaha PSREW400 has touch sensitive keys. So if you want a particular note or chord to sound louder, all you have to do is just press those keys harder. Note, that touch sensitive does not translate to weighted keys (you’ll have to shell out more than $300 for that feature!). 2. What kind of batteries does it accept? If you don’t have a power adaptor, you can use 6 D-size batteries. You can expect this to last for quite some time. Don’t worry if you forget to turn off the keyboard. The PSREW400 has an auto power off function which is great for saving battery power. What Are Other Users Saying About The Yamaha PSR-EW400? "Best 76-Key Casio Keyboard To Learn Piano"
The touch sensitive keys are great for volume control and adding expression to your music. The AC adaptor is included for free. Some beginners may feel overwhelmed with the plethora of options available! This 76-key keyboard is perfect for both beginners and intermediate-level players. In fact, even more advanced players have been impressed with the Casio WK245’s features. Dubbed as a working man’s Steinway, the Casio WK245’s keys have a nice, weighty touch to it. No, it’s not weighted like a real piano but it does have a heavy feel to it that’s absent in the sub-$100 beginner keyboards. The keys are also touch responsive which means if you press softly, the keyboard will emit a soft sound as well. If you press hard, then it will emit a much louder sound. Speaking of sound, the Casio WK245 has been complimented for its collection of 600 built-in sounds so if you play in a band then you can rely on this keyboard to add some nice musical accents to your band’s songs. If you don’t have a band, but would like to pretend you’re in one, then you can use any of the Casio’s 180 built-in rhythms to back you up while you play! You can even use the Casio WK245 as your personal recording studio. You can record up to 5 songs / 6 tracks so if you want to listen to how your music sounds, this is a very useful feature indeed. You can even use the audio input to record your vocals plus any musical instrument of your choice (you can use up to 6 tracks per song!). This is really cool as you can literally record music as a 1-man (or woman) band! This keyboard also offers onboard sampling which means you can record any sound and use at as your keyboard’s voice! For instance, if your music calls for a dog barking or maybe a pig snorting sound in the background, you can record these and then use these as instrument voices! It’s a pretty cool feature and most creative musicians will find plenty of ways to use this. We love the fact that Casio has included a lot of features that are not available on similar models at the same price point. Yes, the keyboard is portable and it runs on batteries, but the great thing is Casio made sure the keyboard ships with its AC adaptor so you don’t need to pay extra for this basic necessity. You can split the keyboard into two so if you are a teacher, you can use the upper half and your student can follow along on the lower half. Lastly, the Casio WK245 has nailed down connectivity to a T. It features an auxiliary input so you can play music on your phone or MP3 player (if you still have those!) and use your keyboard’s onboard speakers. If you want to connect to a computer, all you have to do is just use the USB MIDI port and you can get started playing and editing your music on your PC. 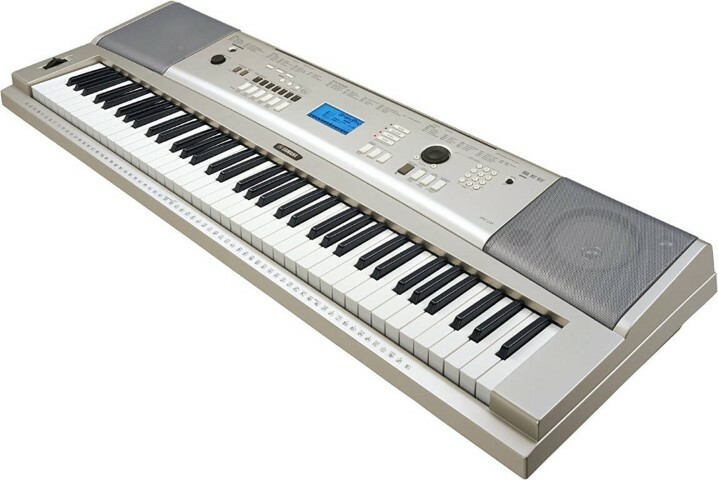 Read our complete review of the Casio WK-245 76-Key Portable Music Arranger here. 1. 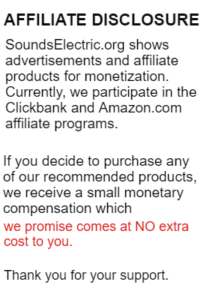 Does it really include a free AC adaptor? Yes, it really does. Unlike the Yamaha keyboard’s we’ve featured in this article, the Casio WK245 includes a free AC adaptor so no need to purchase an extra one. Of course, if you want to use batteries, you’ll still need to purchase 6 D-size batteries separately. 2. Are the speakers okay? I mean, doesn’t the music come out as distorted? The speakers are relatively loud in a small to medium sized room and sounds okay. However, if you compare the speaker sound to a quality headphone sound, then the headphone wins hands down. At this price point, it’s hard to find keyboard speakers that’s going to give a Bose or a Sennheiser a run for its money. What Are Other Users Saying About The Casio WK245? "I got this keyboard as a gift and I must say I was very impressed having come from a long line of Yamaha keyboards over a span of 15 years. I’m not a beginner by any means but I still found myself liking this keyboard very much. The keys have a nice semi-weighted feel to it and the touch response is on point. I’m starting to teach my young niece how to play and she loves playing around with the sampling and recording feature. Like me she also appreciates the connectivity features on this keyboard and loves that she can send her music to her computer and her friends on Facebook!" "As an adult beginner, I am loving the Step Up lesson system. I find that it helps me learn piano so much faster than reading notes alone. In fact, just after two weeks of practicing Twinkle Twinkle Little Star (please don’t laugh! ), I’ve finally managed to perfect this song! Now, I’m off to practice my second song. It’s a Chopin song, by the way." "Best Keyboard For Intermediate Piano Learners"
We think this keyboard offers the best value for money as you can use this literally for years! The Casio WK6600 is a feature packed workstation and arranger keyboard. It has 76 piano-style keys which are touch sensitive; this basically means that if you press lightly, the keyboard will emit a softer sound. If you press harder, then the keyboard will emit a louder sound. It has a lot of ‘bells and whistles’ which a more advanced piano player will find useful such as its 17-track song sequencer which supports up to 5 recordings and around 12,000 notes! Its multi-track recording capability means you can record each individual instrument voice on its own track. Once you’ve recorded your song, you can even edit on the keyboard itself (no need to connect to a computer) and insert, delete, copy, or locate a range of notes you wish to edit. However, if you have music editing software on your computer, you can simply hook up your keyboard via USB or save the data on an SD card. In short, this keyboard is great instrument if you intend to become a songwriter later on in your music career. If you’re a beginner, you might be asking if this keyboard will be good for you. Our definitive answer is YES. The Casio WK6600 is great for beginners as it is for more advanced players. You can play around with the 700 instrument voices, 210 rhythms, digital effects, and more. The 48-note polyphony will also ensure fewer dropped notes when playing. The great thing with buying a more advanced keyboard is you can use it for many years to come. No need for you to buy a new keyboard when you’re ready to advance to the next level because the Casio WK6600 is a great option for all levels of aspiring pianists! If you travel a lot, you’ll find that this keyboard is highly portable at only 16 pounds. If you have no access to AC power, you can simply insert 6 D-size batteries and your Casio will be good to go! When playing at gigs or performing for family and friends at home, you’ll find the built-in keyboard to be more than sufficient though of course you may want to have external speakers or amps on the ready. We also like the fact that the transpose and octave buttons are right on the dashboard, and not hidden in the intricate menu system! The transpose option allows you to go from 12 to +12 semitones which is great if you’re playing accompaniment in a band or church choir. All in all, this is a fantastic keyboard at its sub-$300 price point. Beginners, intermediate and advanced piano players will all find something to love in this keyboard and you will appreciate all the features that Casio has included in a 16-pound package! Read our complete review of the Casio WK6600 76-Key Portable Workstation Keyboard here. 1. Does the Casio WK6600 have some weighted keys? This keyboard has full size, piano style keys with a nice, slightly heavy feel to it but unfortunately, it doesn’t have weighted keys. This is perhaps the biggest drawback to all keyboards at this price range. If you want weighted keys, you’d have to shell out a few hundred dollars more. 2. Are the speakers loud and good? Yes, the speakers are quite loud thanks to both left and right speakers having 6W output. The speakers on this keyboard are louder than the WK245 which has only 2.5W output each speaker. What Are Other Users Saying About The Casio WK6600? "I am thoroughly enjoying this keyboard. I am an advanced player myself and bought this keyboard for my teenage son who wanted to learn how to play. He loves the keyboard and practices all the time but every chance I get, I play on this baby as well! Now he’s asking to have the keyboard moved to his room so he can have it all to himself. I think I might have to get another one soon. I just love the fact that I can easily bring this Casio to my gigs and my mates all love the advanced features it has!" "Coming from a 61-key keyboard, I was thoroughly impressed with the Casio WK6600. I had two Yamahas before this and I must say I wasn’t expecting to be blown away by a Casio. I love that I can record up to 17 tracks (though so far I’ve used only up to 5) and transfer my music easily to my Mac. My friends all envy me because their Yamahas can’t do half of what this Casio does!" As we've shown in this article, there are a lot of features you can choose from when it comes to selecting 76-key keyboards. Whether you are an absolute beginner, an intermediate player, or even an expert, the 5 keyboards we've recommended in this article will be of use to you (and your family and friends, too! ).